Medical Director, Dr. Ulmer, hugs fellow staff member, Mecca Hayes, as doors open. Barrier Islands Free Medical Clinic opened doors to a brand new facility located at 3226 Maybank Highway, Building C, on March 6th. 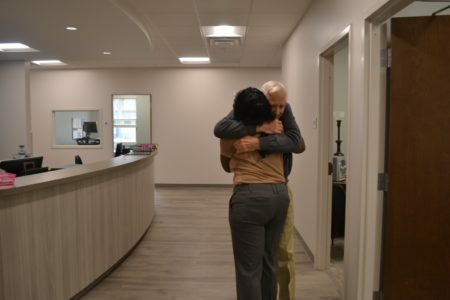 After closing clinic operations for 5 days to accommodate the move, staff and volunteers celebrated the opening of the seven exam room medical clinic on Tuesday with cheers and hugs as doors opened for the first day. In addition to extra patient exam rooms, the clinic now outfits a surgical procedure room, a conference room for meetings and patient education classes, administrative offices and a break room for staff and volunteers. Patients entering the new facility on Tuesday expressed gratitude for the larger, modern clinic. It is estimated that the new clinic will allow staff and volunteers to treat up to 600 patients a month now that space is no longer an issue. Those without health insurance who live or work on Johns, James or Wadmalaw Islands who may be eligible to receive free healthcare are encouraged to call the clinic at 843-266-9800 or check the clinic website for eligibility or download a new patient application. ABC news 4 covered the opening day in a news story for their website on Wednesday. If you would like to help the clinic cover the costs of medical supplies and furnishings for the new facility, you can contribute directly to the #BIFMCbuild fund here. Find more photos from the event via our Facebook page.